Monodactylus sebae common name mono sebae or just mono. The maximum size these fish can grow is up to 20 cm / 8 inches. 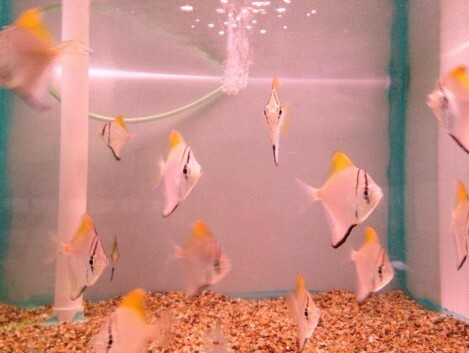 They live in water parameters of Ph range 7.0 / 8.0 and temperatures of 24- 28 Celsius / 75-82 °F. Mono fish are semi aggressive, so they are best to be mixed with other semi aggressive fish. And as they don’t stay small mixing them with bigger fish is best. The mono fish is a brackish water fish so they do require aquarium salt in there water. We do recommend testing your salt levels before adding these fish in to your tank. Small sized mono can take lower salt levels but the larger size do need stronger salt levels, they can even take a weak marine salt level. The mono fish will eat any food you put in for them. They do like frozen or live brine shrimp, or blood worms, also a little bit of vegetable matter like lettuce is nice for them every now and then. They are a shy fish when on there own, so mixing them in small groups can bring them out. As one single mono can hide and the mono fish is a lovely mid swimming fish, so it is nice to be able to see them swimming about. Mono are greedy they will eat anything you put in the tank. Flakes, pellets, granular foods are all good for them. Feeding live and frozen foods is a must to keep these happy and healthy.